Keeping your cat in ideal body condition is crucial as overweight cats are more likely to suffer from health conditions such as osteoarthritis, diabetes and urinary problems. Focusing on diet and exercise is the best way to keep your ensure that your cat stays at a healthy weight. After all, prevention is always better than cure, so be sure to keep up activity levels especially if you have an indoor cat. The majority of indoor cats do not get enough exercise to keep their bodies fit and minds stimulated. But exercise is good for more than your cats waistline. By sticking to a regular feline workout plan, you’ll have a major positive impact on your cat’s overall health, behaviour and overall quality of life. It can be challenging to help your cat reach a healthy weight if you own multiple cats. As typically an overweight cat, in a multi-cat home, is dominating the bowl at feeding time. If this is the case, it is vital that you have no communal feeding bowls and, have a small individual bowl for each cat instead. You also need to establish a firm schedule of when you are going to feed your cats and where you are going to feed them. If you are worried that your overweight cat will eat the other cat’s food as well as their own, feed your cats in separate rooms. 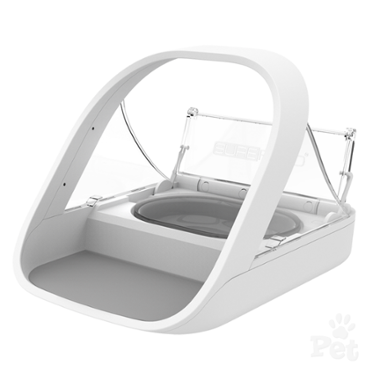 Another way to work around this is to use an automatic pet feeder like the SureFeed Microchip Pet Feeder, that can be programmed to automatically open for the designated pet by scanning their microchip. This makes for an easy way to ensure your pets do not get into each other's food. Cats like humans sometimes feel “hungry” when they are really just bored. So it is paramount to ensure your cat has a steady supply of clean and fresh water. As if they get bored they can consume fresh water instead of boredom eating. Cats naturally are more inclined to drink flowing water, probably because it tastes better due to being cooler and more oxygenated. Flowing or moving water is more attractive to cats, which is why many times cats will drink from taps. Because it is more enticing, it can also help to get them active you may notice them pawing or splashing the water. A great way to provide flowing water is with a water fountain or auto-refill bowl. One of the most crucial factors for maintaining a healthy cat is diet, and since cats are carnivores, they need to consume a lot of protein in order to stay healthy. Make sure that whatever cat food you buy is at least 35% protein. Also, fats and carbohydrates combined shouldn’t make up more than 50% of your cat’s diet. Although when feeding an overweight cat it may be worth looking into a low-calorie or healthy weight cat food formulation. But keep in mind that these can be less palatable to cats than traditional formulas, but you can drizzle the food with something tasty and healthy like bone broth to make it more appealing to your cat. But as with any food changes, it is critical to slowly transition your cat onto the new food to avoid upsetting their stomach. Keeping your cat moving does not have to be tiring! One quick and easy way to get your cat active is with a laser light or pointer. When used correctly laser pointers can help to keep your cat both physically active and mentally stimulated. Plus they are a great way to play with your cat from the comfort of your own chair, which is great if you lead a busy lifestyle or have an indoor cat. But when using a laser pointer you need to be careful to not shine it in your cats eyes and to limit play time to 15 minutes so as to not over do it. Catnip can be helpful at encouraging cats to get active and feel comfortable around new toys and environments. There are two common reactions to catnip, some cats become like a lazy drunk meanwhile, others get a wired-up crazy. If catnip has a positive effect on your cat's energy levels, you can use it as a training aid or an occasional treat. It comes in both leaf and spray forms or you can purchase toys with catnip built in to them. It can be used to encourage the use of scratching posts, to get cats comfortable in new environments or to encourage activity. One way to entertain and challenge your cat is by ditching the bowl and putting their food in a puzzle feeding toy. These toys require that the cat earns their meals by making them use their brain and body to get the food out of the toy. They are available in a range of designs and levels of difficulty and work well to stimulate your cat and decrease its feelings of boredom or depression all while encouraging them to get active and drawing on their natural instincts to hunt to work for their food. Cat trees help to satisfy a cat's natural urges for climbing and scratching, these activities are great for keeping your cat strong, fit and healthy. When selecting a cat tree look for one with platforms, hiding holes, and sturdy posts that the cat can scratch. It should be tall enough that your cat can fully stretch while scratching. There are a wide range of styles and sizes available to suit homes of any kind. 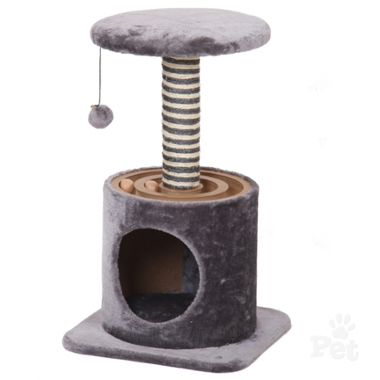 You can even get cat trees that incorporate toys, like the PetPals Velocity Cat Scratcher Tree which has a comfy floor level hideout, high platform, scratching post and built-in ball chase game. But when selecting a cat tree, consider placing it in a central location so the cat feels included and can watch over you while you go about your daily activities. You can even have multiple scratching posts or cat trees to encourage activity and help to prevent your cat from scratching your furniture. One way to help your cat get active is to adopt another cat! But it is important to think about your cat's personality before doing so. Although cats are social creatures they can be very territorial and not all cats cope well living with others. But having a playmate for your cat can be a great thing, playing together helps to boost their social interaction skills and provides them with an outlet of exercise. So if you only have one cat, you might want to think about taking in another one. But be sure to consider what cat would best suit your existing cat's lifestyle, for example generally young cats get along with other young cats. When you are trying to help your cat reach a healthy weight it is key to consider everything that your cat is consuming. Even though cat treats may be small they are generally high in calories, so be sure to factor these in when weighing out your cats daily food intake. If you are feeding treats on top of the number of calories that your cat should be getting every day to lose weight, they will struggle to lose weight. An easy thing you can do is reserve a small amount of your cat's daily meals to use as treats throughout the day. As treats can play an significant role in encouraging your cat to get active and to build a positive relationship with your cat. Cut the grazing, with set meal times. Cats tend to be more into “grazing” on dry food all day than dogs, but this often leads to overeating. Cats are carnivores and are not designed to graze like their herbivore counterparts cows and horses. So it is important to wean your cat off grazing and have strict set feeding times. This means feeding at the same time every day and only leaving the food out for an hour at mealtimes, then taking it away. For indoor cats, a great way to help them to get more active is to leash train them, so they can go outdoors for walks on a harness and leash. Although the best time to introduce your cat to a harness is as a kitten because they will be naturally more accepting of it. This does not mean it cannot be done with an older cat! If you’re patient and take it slow, you are able to make leash training a positive experience for your cat. However, keep in mind that walking on a leash and venturing outdoors isn’t for every cat. Some cats may never be comfortable on a leash or outdoors due to age, health or personality, and you should never force your pet outside of his comfort zone. Introduce regular play sessions and remember that anything that moves will appeal to cats, as it gives them a chance to polish their natural hunting skills. There are many interactive toys for cats from balls, to laser lights and teaser toys. Consider the Catit Senses 2.0 Super Circuit - an extra-long circuit ball toy that stimulates cats to chase the ball within the track. 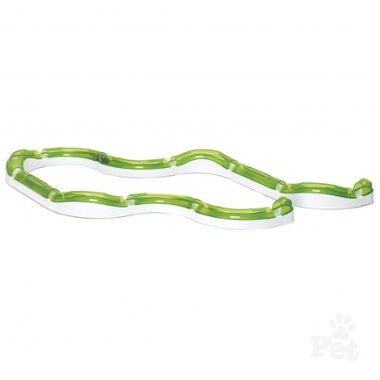 Interactive toys like this are a good way to keep your cat moving and having fun. One thing to keep in mind is that the peak activity time for cats and kitten is in the early morning and in the evening. So it is often a good time to play with your cat before you go to bed that they are worn out and ready to sleep when you are. The amount of food you should feed will vary greatly depending upon the caloric density of the specific food that you are feeding. The number of calories your cat utilises is based on the daily energy requirement for your pet and the amount of exercise he/she receives. The level of calories a cat need highly depends on its activity levels and these vary a lot between indoor and outdoor cats. The amount of food you should feed will vary greatly depending upon the caloric density of the specific food that you are feeding. The number of calories your cat utilises is based on the daily energy requirement for your pet and the amount of exercise he/she receives. The level of calories a cat needs highly depends on its activity levels and these vary a lot between indoor and outdoor cats. It is very beneficial to use a measuring cup to get the portion sizes right especially when helping your cat to reach a healthy weight. One other thing to keep in mind for overweight cats, is not to feed for their current weight but for their target healthy weight. If you need any help determining what your cat's ideal weight is, a vet visit is a great way to help you get a second opinion and start you on the right track to weight loss. Keeping your cat does not have to be hard, even if your cat lives only indoors there are many toys that encourage active behaviour and draw off cats strong natural hunting and climbing instincts. But as with human weight loss, a major thing is monitoring what they are eating, this can easily be done by measuring their food, ensuring they are not stealing food from other pets and talking to your vet about switching to a lower fat food formulation. After all, the benefits of keeping your cat active are definitely worth the effort, helping your cat to be happier, healthier and live a longer and more fulfilled life.